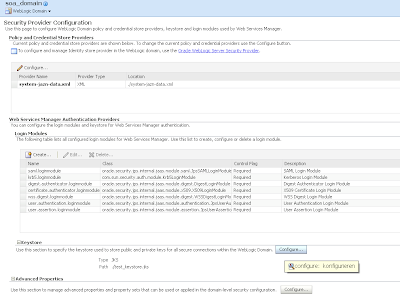 With Soa Suite 11g you can deploy your composite applications from JDeveloper or with ANT. In this blog I will do this with the SOA 11g ANT scripts. These ant scripts can only deploy one project so I made an ANT script around the SOA ANT scripts which can deploy one or more composites applications to different SOA environments. So now you can use it to automate your deployment or use it in your build tool. In my ant script I will deploy shared artifacts to the MDS, compile, build and package the composite applications and deploy this to the SOA Server. After this I use an ANT script to start the unit tests and generate a JUnit result XML and at last I can optional disable the composite. This JUnit XML can be used in your continuous build system. 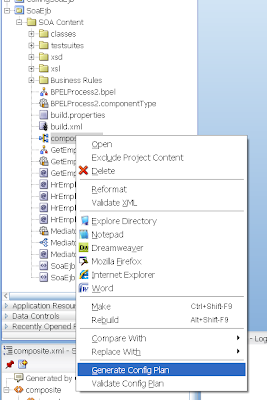 You can easily extend this build script so you use it to manage the composite applications. For more info over ANT deployment see the official deployment documentation . 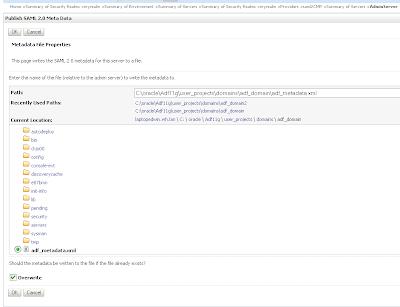 ant-sca-test.xml, This script can start the test suites of the composite and generates a juinit report and not Attaches, extracts, generates, and validates configuration plans for a SOA composite application, The official documentation description is not correct. ant-sca-compile.xml, Compiles a SOA composite application ,this script is also called in the package scrip, so we don't need to call this directly. ant-sca-package.xml, Packages a SOA composite application into a composite SAR file and also validates and build the composite application. 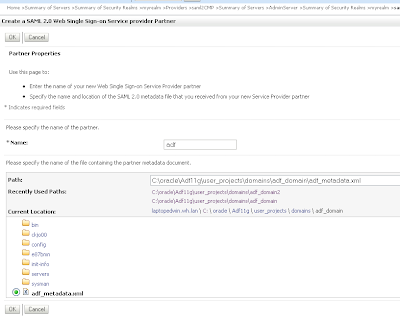 ant-sca-deploy.xml, Deploys a SOA composite application. 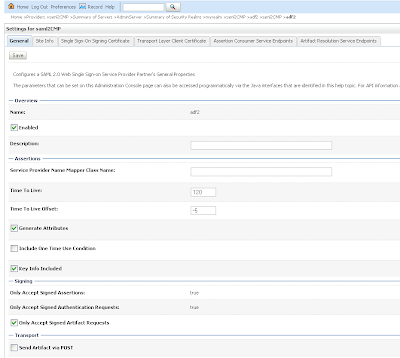 ant-sca-mgmt.xml, Manages a SOA composite application, including starting, stopping, activating, retiring, assigning a default revision version, and listing deployed SOA composite applications. Here is the main build.properties where you have to define the jdeveloper and your application home, which composite applications you want to deploy and what is the environment dev or acc. Every application can have one or more SOA projects so the main ant script will load the application properties file which contains all the project with its revision number. 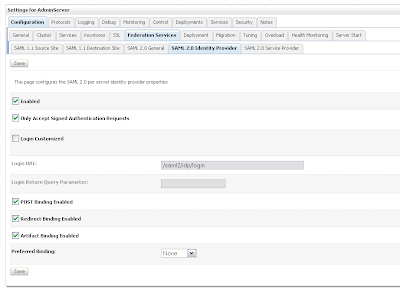 Because in my example I have two soa environments so I need to create two configuration plans. With this plan ( which look the wls plan ) can change the url of endpoints so it matches with the environment. 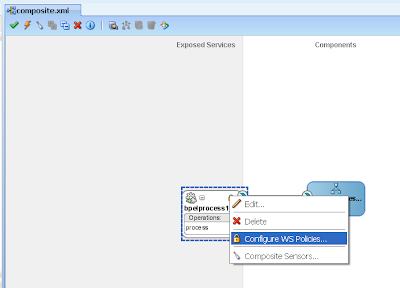 Select the composite application xml and generate a configuration plan. Add the dev or acc extension to the file name. Here you see how the plan looks like. 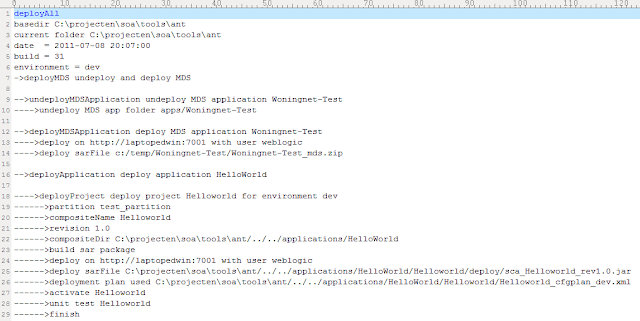 And here is the main ANT build script which can do it all and calls the Oracle ANT scripts. And finally the CMD script to run this ANT script. To make this work we need the ant-contrib library and put this in the classpath of ANT or put it in the ANT lib folder. SAR and MDS z ipsfiles are bundled under build number. 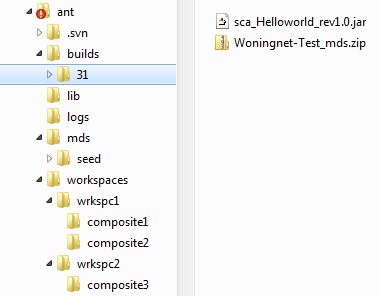 The new file structure with a logs and build folder. The logging of a run. 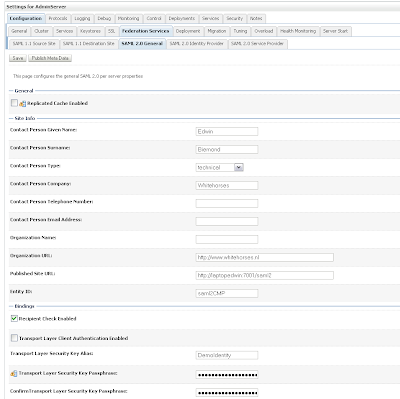 This blog is about how you can run a batchjob on a specific time in the Weblogic application server and as extra, I made an ADF page in which you can stop or start the jobs. This job schedular can start for example some Soa processes at a specific time. 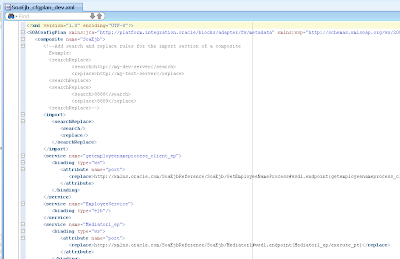 The scheduling is done with the help of the CommonJ API which is standard in Weblogic. This example works perfectly in a managed node but if you want to do the same in a Weblogic Cluster then you should not read this blog and go the James Bayer's blog . 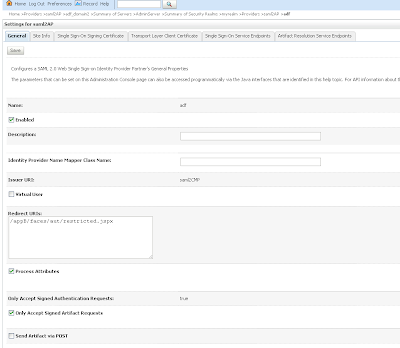 And for more information about Timer API see the official Weblogic documentation. Very important, this job scheduling only works within in a web application. 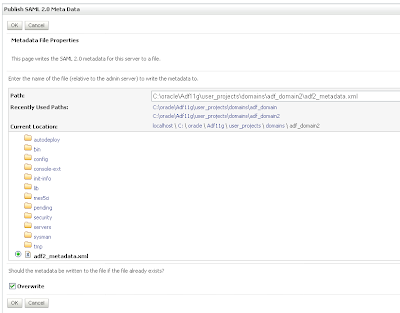 Now we done this we can add a servlet which start this TimerManager and its jobs. Important that the servlet is automatically started when the webapp is started. Here is an example of a batch job. The timerExpired method is fired every time when the job time has passed. Here you can put in your own code and when the job is canceled then the TimerCancel method is fired. And finally the JSF page with its backing bean to control the jobs. 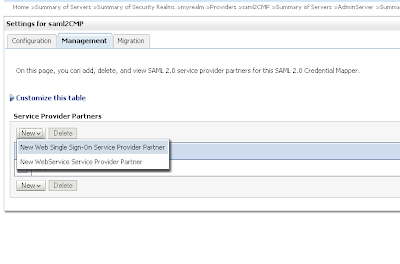 <af:commandButton text="Time Manager On / Off" id="cb1"
<af:commandButton text="Batch 1 On / Off" id="cb2"
<af:commandButton text="Batch 2 On / Off" id="cb3"
Probably you already knew the Web Service Manager of Soa Suite 10.1.3, The 10.1.3 version was mainly used in combination with Soa Suite because this was the only way to secure the BPEL and ESB Services. 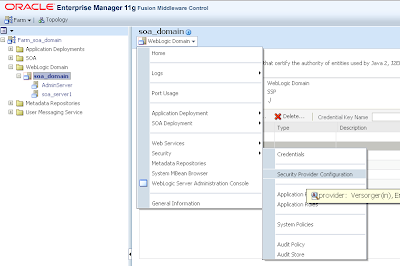 In FMW 11g Oracle changed WSM so it is fully integrated in all the Fusion Middleware components. 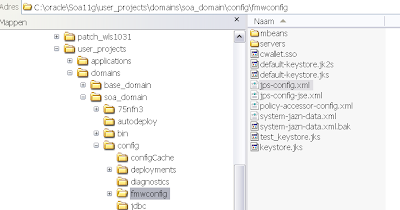 Now you can use WSM in ADF, in the Services and References of Soa Suite and in the jax-ws services or proxy clients. 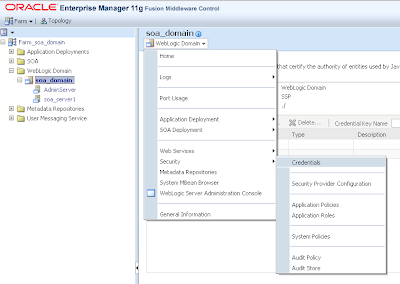 In FMW 11G you can also define your own ws-security policies ( just use a wizard in the EM website) or use the standard policies, So it can always comply to your security requirements. 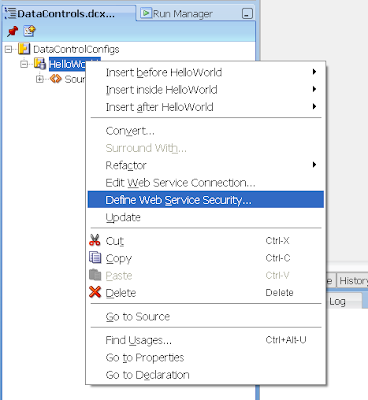 In this blog entry I will show you how to setup FMW on Weblogic and define security on a BPEL service, call this service with an ADF Web Service Datacontol and a java web service proxy client. Special thanks to Vishal Jain of Oracle who helped to solve the issues and explained how WSM works with keystores. 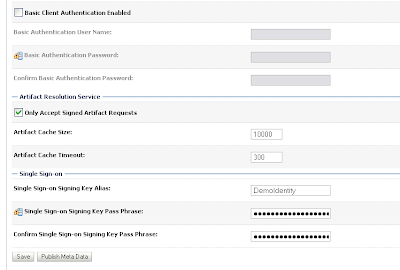 First we need to generate a keystore with a self signed certificate. Somehow certificates with generated with OpenSSL fails in FMW. 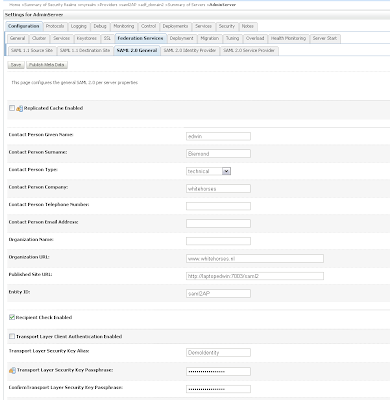 Go the Enterprise Manager Website where we can configure the just created keystore. 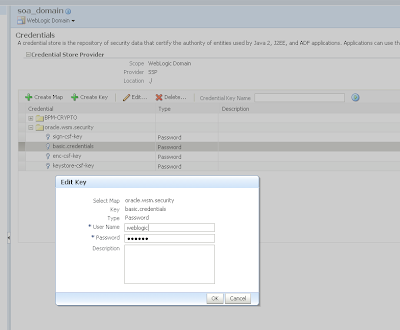 We have to select the weblogic domain and go to the security menu / credentials. Here we can change maps or passwords which will be stored in the cwallet.sso file. If you see the oracle.wsm.security map then you can delete this map. This map contains the keystore password. Press the Configure button in the keystore part of the screen. 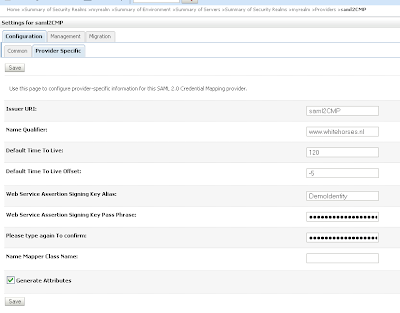 Here we can add the keystore details. Use ./ as keystore path. 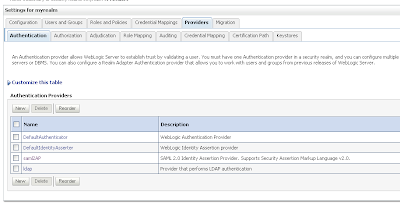 This will fill the oracle.wsm.security map in the credentials menu. 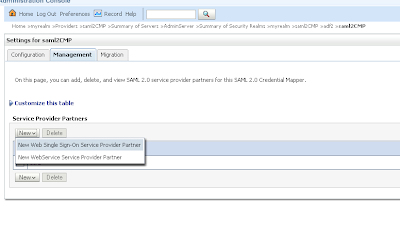 Next part is to add a wsm policy to a BPEL Service. 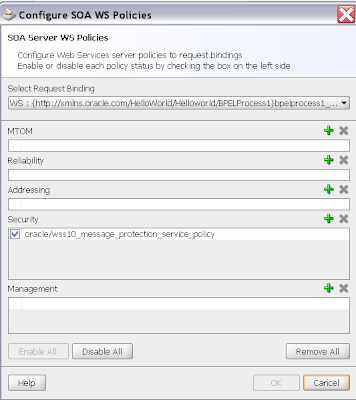 Select the server policy you like to use and deploy this to the soa suite server. Now we can make a jax-ws proxy client so we can test the policy. In this client we will use the matching client policy. If this fails check your libraries. If all went well then we can do same with a ADF Web Service Datacontrol. 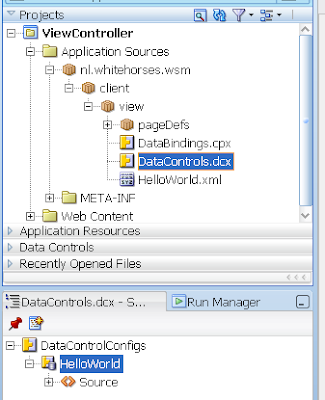 To add the client policy select the DataControls.dcx and go to the structure window. 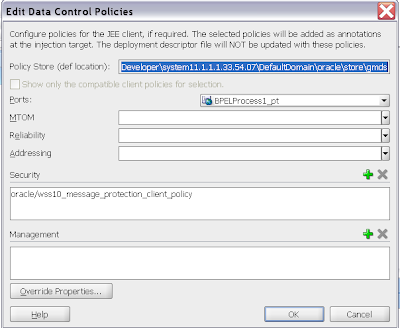 Select the right client policy and in this case we need to override properties, press the button and fill in the recipient with your key alias. Else you will get a orakey error. 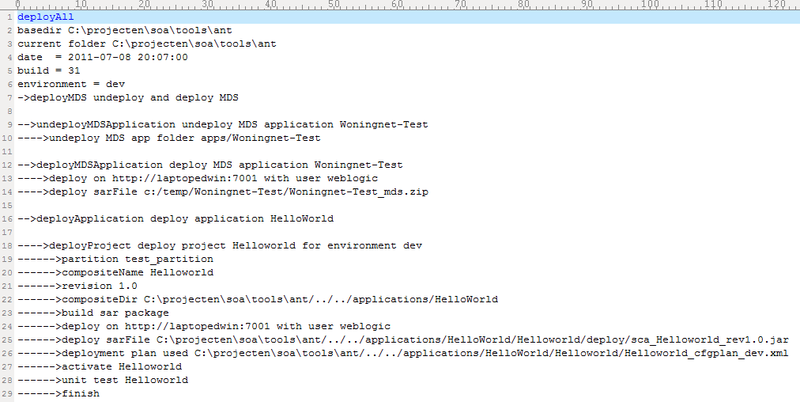 And at last deploy this webapplication with a ear profile to the Soa Suite server and test your webapp.